A team of volunteers trekked all over the site interviewing over 400 traders during the Festival. They asked questions about everything from how traders and their staff got to the Festival, to what their stall was made of, how much of their stock was Fairtrade, organic or recycled and any other ethical criteria they used to reduce their impact on the environment. The judging process involved much debate and a little mystery shopping, before the winners and runners up were chosen. Hurly Burly won a Gold Award for their commitment to serving up healthy Fairtrade and organic food to hungry Festival-goers from their solar-powered van. And Two Skies was also a Gold Award winner thanks to stall owner’s Adam McIntosh’s enthusiastic engagement with his customers around the ethical sourcing of his jewellery and his commitment to working closely with suppliers. 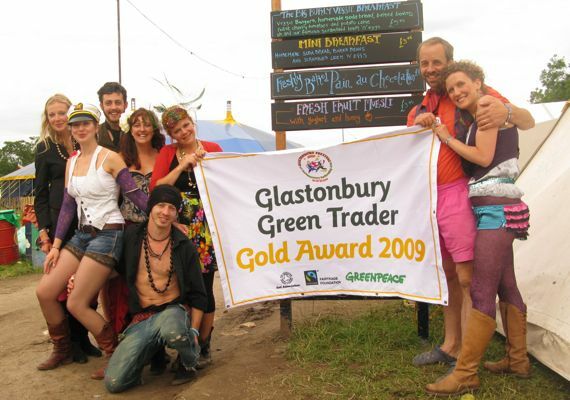 Glastonbury Festival, Greenpeace, The Soil Association and The Fairtrade Foundation have been running the Green Traders Awards since 2006. Their aim is to acknowledge and recognise festival traders who have done the most to give their businesses a low environmental impact.